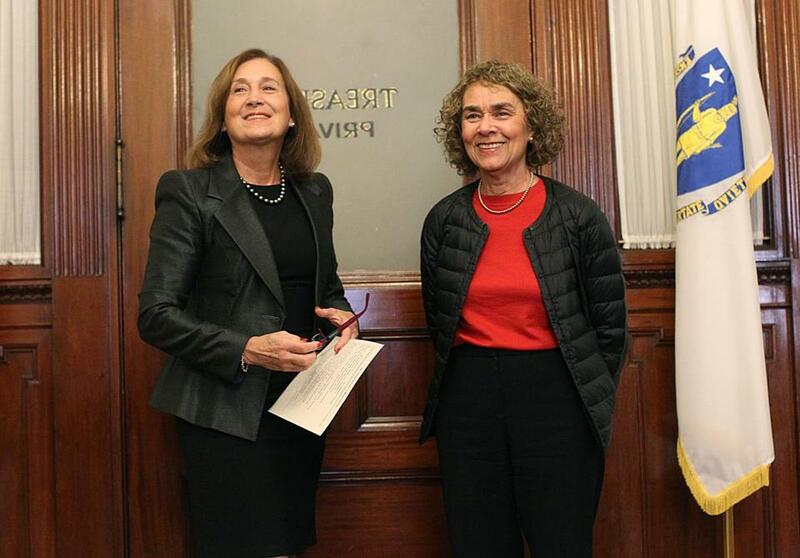 State Treasurer Deborah B. Goldberg, left, with Ruth Ellen Fitch of the state pension board. State Treasurer Deborah Goldberg says she cannot press the $60 billion Massachusetts state pension fund that she chairs to divest from gun stocks without action by lawmakers. The Pension Reserves Investment Trust holds $2.2 million worth of publicly traded shares in two large gun manufacturers and a gun seller, including $465,000 in Springfield-based Smith & Wesson Holding Corp. The sum is a drop in the bucket for the fund, just 0.2 percent of its total holdings. But the stocks have been profitable. Smith & Wesson and Sturm, Ruger & Co. of Southport, Conn., have vastly outperformed an index of similarly sized companies over the past year. Like many pensions, endowments, and individuals saving for retirement, PRIM defers to the professional money managers of its index funds — those that own an entire list of stocks. “PRIM staff leaves all divestment decisions to the Legislature,” said Eric Convey, a spokesman for the state pension fund. Massachusetts lawmakers have previously passed measures requiring the fund to divest from tobacco companies and those that do business in South Africa and Sudan. But it’s a long process, at a time when many Americans are questioning whether they want to be profiting from guns. “You buy the index. There’s no wiggle room on that,’’ said Amy Domini, founder and chair of Domini Social Investments, a $1.6 billion money manager based in New York that excludes weapons and other controversial investments from its funds. Domini, coincidentally, grew up in Newtown, Conn., and attended the Sandy Hook Elementary School, where 26 children and adults were killed by a gunman in 2012. She also used guns herself on occasion: “Newtown was farm country then,’’ she said. Two of the nation’s largest and most influential public pension funds, the California Public Employees’ Retirement System and the California State Teachers’ Retirement System, elected to divest firearm stocks in 2013, after Sandy Hook. But many pensions and endowments have not taken such action. Major endowments such as at Harvard University and the Massachusetts Institute of Technology declined to disclose their holdings in firearm companies. Those schools have faced protests from students, but mostly for investments in fossil fuel companies and other issues. Deborah Azrael, research director of the Harvard Injury Control Research Center and an authority on guns, said she finds it concerning that gun stocks tend to rise after massacres like the one in Orlando. “To me, the notion that Harvard’s endowment – any university’s endowment — goes up because of a non-fact-based fear that guns will be taken away from people in the wake of a mass shooting is abhorrent,’’ Azrael said. Gun and ammunition manufacturers generated $15 billion in revenue last year, according to IBIS World, a Los Angeles-based research firm. Gun and ammunition stores had $3.1 billion in sales. On Thursday, Smith & Wesson reported a 31 percent jump in revenue, to $723 million, for its fiscal year ended in April and projected sales rising to as much as $760 million this year. Profits climbed 89 percent to $94 million. “We believe in the long-term growth aspects of the market,’’ James Debney, the company’s chief executive, said on an earnings call with analysts. Vanguard Group, the Valley Forge, Pa.-based investment firm with $3.5 trillion under management, is the largest owner of Smith & Wesson shares.